Here are lots of honey bee facts, including quick snippets of information to get you started, general facts, scientific research, historical points of interest plus a couple of quirky facts about honey bees. general bee facts which covers other bee species. If there is a snippet of information of particular itnerest, why not follow the link and bookmark the page for further reading? The honey bee is also known as Apis mellifera. Apis is a very old word probably with Egyptian roots, but is also related to the Greek word for 'swarm'. Mellifera means 'honey-bearing' in Latin. Only female honey bees can sting, the males (drones) are not able to sting, but if you are stung it will probably be by a worker. Queen honey bees can sting, but they remain close to the hive, and so a sting form a honey bee queen would be very rare. If the queen honey bee is removed from the hive, within 15 minutes, the rest of the colony knows about it! A typical honey bee colony may have around 50,000 workers. Male honey bees (drones) have no father, but they do have a grandfather! A honey bee queen may lay as many as 1000 - 2000 eggs per day as she establishes her colony. Honey bees communicate through pheromones passed on through feeding. This is called ‘trophallaxis’. Learn more on this page. 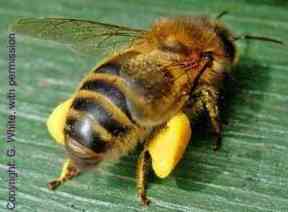 Drones (male honey bees) die after mating. Poor things! Follow this link to learn more about drones. Once honey bee eggs hatch into worker larvae, they’ll be fed around 1,300 times per day! (More information here). Foraging bees have to fly about 55,000 miles to produce a pound of honey, visiting around 2 million flowers. Check out this link to learn more about how bees make honey, by clicking here. Honey bees are generally thought not to be 'door step' foragers - in other words, they fly further afield to find food. They may typically fly between 1 – 6 km on a foraging trip, but also up to 13.5 km (I have seen it stated that 20 km has also been recorded, but have not located the research paper to check this finding). Read more about how far bees fly. No wonder honey bees need a lot of energy. Honey bees fly up to 15 mph and beat their wings 200 times per second or 12,000 beats per minute! Each honey bee makes about 1 twelfth of a teaspoon of honey in its life time. Find out how bees make honey here. The honey bee is the only insect that produces a food eaten by man. Worldwide there are 10 types of honey bee, and one hybrid – the Africanized bee. The honey bee is one of the most studied creatures in the world after man! Honey bees are believed to be descendents of wasps. 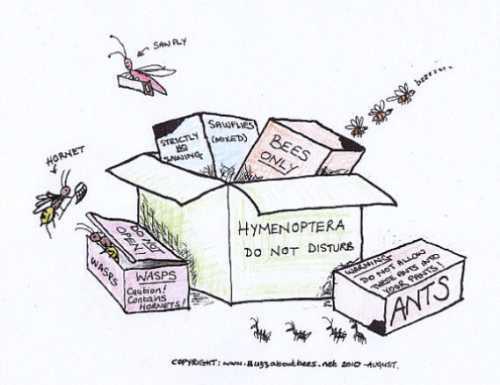 Honey bees belong to the insect order 'Hymenoptera' which they share with other bees, wasps, ants and sawflies. Scent is important for bees. A study has found that bees are better at learning new odours in the morning. Honey bees eat nectar and pollen, but there are times when food is scarce, and they may eat insect secretions. They are also known to eat a little fruit, such as plums and grapes. Read more. The honey bee queen should certainly live 2 years, but may even live 3 or 4 years, whilst drones live for 4 – 6 months, and worker honey bees raised in the Spring may only live 6 or 7 weeks (those raised in the autumn may, like drones, live 4 – 6 months). Find out more about the honey bee life cycle. The hexagon structure of honey combs enables bees to make super efficient use of beeswax, and guards against wastage! The 'Waggle Dance' or 'honey bee dance' enables worker honey bees to inform her sisters about great locations of food and water, or a new home. Like other bees, honey bees cannot see the colour red. However, they may visit red flowers because they are able to see the U.V. patterns in the flowers. Find out more about how plants attract their perfect pollinators by visiting this page about flower pollination. Honey bees are often thought of as living in wooden bee hives made by humans, but in fact a honey bee colony in the wild will naturally choose to build a nest in cavities, such as a tree hollow or cave - or around homes, they may even nest in an unused chimney. As with other types of bees, Honey bees have 5 eyes: 3 simple eyes on top of its head, and 2 compound eyes, with numerous hexagonal facets. Honey bees account for nearly 80% of crop pollination in the United States of America, because of the ease of transporting colonies across the country (although increasingly, some solitary bee species and bumblebees are being reared for pollination). Honey bees are actively pollinating at least somewhere in North America during every month of the year! To keep warm in winter, honey bees huddle together in a 'winter cluster'. 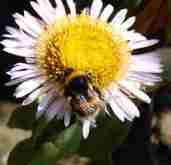 Honey bee activity is dependent on temperature, rather than the seasons as is the case with other bee species. Honey bees are most active between 60 - 100 °F, although they can forage in temperatures as low as 55 °F. For this reason, almond crops in California are dependent on honey bee pollination, because the trees bloom in February, before many wild bee species emerge from hibernation. Scientists have studied honey bees, and have learned that honey bees sleep. Read more. Below is a photograph - image D on the far right shows the bee snoozing, with antennae drooping and abdomen touching the floor. The honey bee's brain is about the size of a tiny grain of sugar, but researchers have found that the it is surprisingly sophisticated. Specifically, honeybees can understand conceptual relationships such as "same/different" and "above/below" that rely on relationships between objects rather than simply the physical features of objects. Scientists have discovered that honey bees are able to 'vote' when making decisions about where the colony should create a new nest site! Female 'scout bees' fly out to look for potential sites, and report back to the colony, using the famous waggle dance to inform the rest of the colony about the location of the nest - and the better the potential site, the more enthusiastically the scout bee dances! If other worker bees like the potential nest site, they begin imitating the dance, until eventually a 'critical mass' has been achieved, with enough worker bees in agreement about the new nest site such that a decision is made. Honey bees have been trained to act as bomb detectors! Scientists have trained honey bees to react to minute amounts of chemicals found in explosives. Trainers reward honey bees with sugar water when they correctly sense a particular explosive compound, such that the bees automatically stick out their tongues in expectation of a reward when they correctly sense the compound! By digitally reconstructing the complete brain of the European honeybee, Apis mellifera, researchers hope to one day create an autonomous flying robot that thinks, senses, and acts like the sophisticated pollinator - personally, I would prefer it if we keep our pollinators and look after them! Honey bees have been around longer than humans – there is fossil evidence from 150 million years ago! Different countries have kept bees in different ways. For example, in Europe, people kept bees in straw baskets called skeps, or even in tree trunks adapted for the purpose. In parts of the Mediterranean and Middle East, clay jars were used. Read more about the history of beekeeping. The ancient Egyptians used honey as food and medicine. It was also used in offerings and for embalming the dead. Beeswax was used in magic rites, for preserving and also in medicine. Today, honey is believed to have health benefits. Find out more about the health benefits of honey. Humans have been seeking out bees for honey for a long time! Mesolithic rock-paintings in caves near Valencia, Spain, show honey hunters at work. These paintings are believed to date back 6,000 years. It wasn’t until 1586 that it was recognized that the head of the honey bee colony is a female queen. This news was popularized by Charles Butler (the ‘Father of English Beekeeping’) in his book ‘The Feminine Monarchie’ in 1609. Prior to that, it was assumed the head of the colony must be a male – a ‘king’. Even William Shakespeare, in Henry V, refers to honey bees living in a kingdom, with a king as ruler. Honey can be fermented to make a type of wine, called ‘mead’. The earliest evidence for the production of mead is from Northern China, and dates to back to about 7000 BC. In 1791, during the French Revolution, the government demanded a record of all hives. Honey was used as a source of tax revenue. 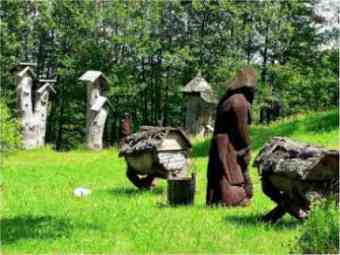 Many beekeepers who did not wish to pay more tax, destroyed their hives. - The Bible has many references to honey (among the most famous is the 'Land of milk and honey' , but also Proverbs 16:24 "Pleasant words are a honeycomb, Sweet to the soul and healing to the bones." - There are many Hindu references to honey - there is even an Indian Bee goddess - Bhramari Devi - the word Bramari, meaning ‘Bees’ in Hindi. Krishna has been depicted as a bee. "My soul is enticed by the honey-sweet lotus feet of the Lord; night and day, I thirst for them." When the fictional character, Sherlock Holmes retired to the Sussex Downs in England, where he became a beekeeper. There is even a group called "The Retired Beekeepers" in England who are actually an international group of Sherlock Holmes enthusiasts. Honey is loved by fictional characters Yogi bear and Winnie the Pooh. More honey bee facts here! You may have heard about the many problems faced by our bees, such as the phenomenon of Colony Collapse Disorder. Learn more here. 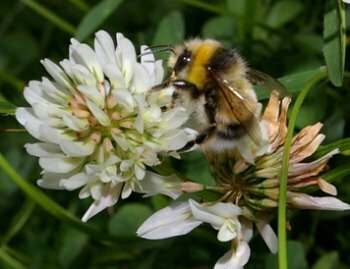 A link to lists of great bee plants! 10 Ways to Save the Bees! Test you knowledge with a fun quiz about bees! Go back from Honey Bee Facts to Home page.